BOULDER, CO--(Marketwired - November 18, 2014) - SolidFire, ranked the storage industry's #1 Solid-State Array, today introduced Version 7 of its Element OS, named Nitrogen, as it continues to broaden its footprint within enterprise-class data centers. Building upon six previous versions of Element OS's full enterprise feature set, Version 7 Nitrogen continues to deliver completely non-disruptive upgrades. Nitrogen introduces significant new functionality including multi-tenant networking and snapshot consistency groups, along with a series of usability features that deliver industry-leading flexibility for consolidating a broad mix of application workloads. At the heart of SolidFire's robust non-disruptive upgrade process is its Shared-Nothing High-Availability Architecture. Unique among all-flash arrays, SolidFire's high-availability design has enabled thousands of in-field, in-production upgrades without disruption to data access or compromise of SolidFire's industry-leading guaranteed Quality of Service (QoS) capabilities. No downtime, data migration or planned outages are ever required when upgrading the SolidFire storage platform, and Nitrogen is no exception. Calligo, one of SolidFire's very first customers, has run its entire offshore cloud infrastructure worldwide on SolidFire since the all-flash scale-out platform went into general availability in November 2012. "Because Calligo delivers a wide range of cloud services with guaranteed performance and the highest levels of data protection and privacy to thousands of users, we simply can't suffer extended storage downtime or risk losing data from upgrades or any other reason," said CEO and Co-Founder of Calligo, Julian Box. "We've been running SolidFire's scale-out all-flash storage platforms seamlessly in our multi-tenant data centers for over two years now. We have had no downtime, no unnecessary risk or lost sleep. Upgrades have been completely safe and non-disruptive, allowing us to deliver data services at consistent operational and contractual standards." "For too long the pace of storage system progress has been slowed by the complexity and risk of system upgrades. Customers feared the upgrade process, forcing vendors to delay updates and create risky big-bang releases. At SolidFire, we've changed that paradigm with simple, low-risk upgrades and a regular cadence of new feature releases," commented SolidFire's Founder and CEO, Dave Wright. "One of the most powerful aspects of SolidFire's design is its shared-nothing high availability architecture. It is the driver behind our proven ability to upgrade without disruption or compromising QoS settings, and it is what allows us to increase the pace of feature delivery to our customers." Multi-tenant networking -- With Nitrogen's VLAN-based multi-tenant networking functionality, SolidFire enhances customers' ability to separate individual customer or business unit traffic for security, auditing and fault isolation use cases. Consistency Groups -- Since introduction, SolidFire has been recognized for industry-leading capabilities in automation and data availability. Nitrogen enables automated creation and execution of consistency groups for consistent group snapshots, eliminating the need for third-party software for disaster recovery, data protection, large dataset management and data lifecycle management. Learn how SolidFire's scale-out all-flash storage platforms increase IT departments' responsiveness to business functions. 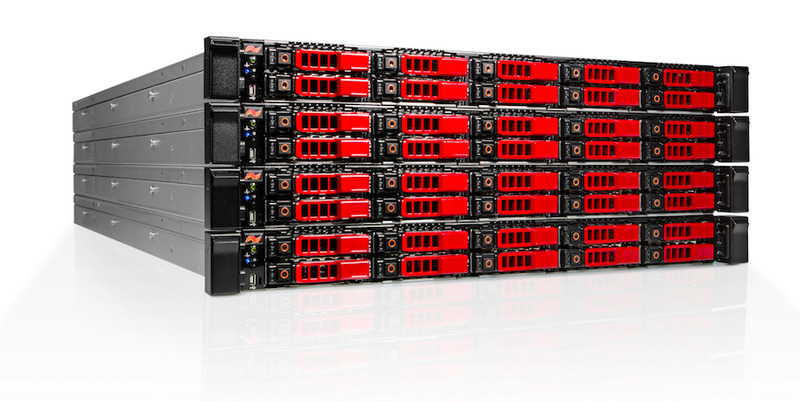 Read about SolidFire's new SF Series storage platforms, which start at 35TB of effective capacity and deliver guaranteed performance to every workload. Schedule a SolidFire demo today. SolidFire is the market leader in all-flash storage systems built for the next generation data center. Leveraging SolidFire's all-flash architecture, with volume-level Quality of Service (QoS) controls, customers now can guarantee storage performance to thousands of applications within a shared infrastructure. Coupling this functionality with in-line data reduction techniques and system-wide automation results in substantial capital and operating cost savings relative to traditional disk and basic all-flash storage systems. Learn more: www.solidfire.com | www.twitter.com/solidfire | https://www.linkedin.com/company/solidfire-inc.